Bluetooth speakers are great when it comes to portable music listening. It’s a great compromise between wired speakers and low-quality sound from a smartphone. They are quite a few companies that manufacture Bluetooth speakers. One of such companies is TaoTronics. This company specializes in producing small electronics and accessories since 2008. If you want to know more about these speakers, check the list below. 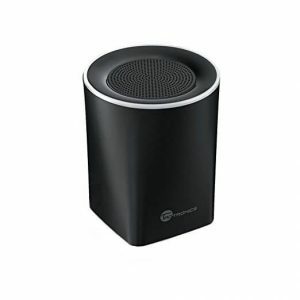 This speaker is the most affordable from the ones presented here. It weighs only 0.36 pound and offers 3 watts of power. It has a non-removable battery that can be charged with micro USB port. The whole process lasts about 3 hours and allows you to listen to music up to 6 hours. When a battery is low you will be informed with alternating red and yellow LED light. The device offers no sd card reader, so it has to be paired with a smartphone or other Bluetooth device. You can also pair two speakers together by pressing and holding the pause/play button. It offers microphone Bluetooth communication, so you will be able to answer the phone when somebody calls. When it comes to loudness, it’s quite decent, but better use it indoors. It’s not enough powerful to be listening outdoors, especially when there is a loud background noise. PROS / Can be paired with another speaker, affordable, good charge/use ratio. CONS / Not good for outside use. 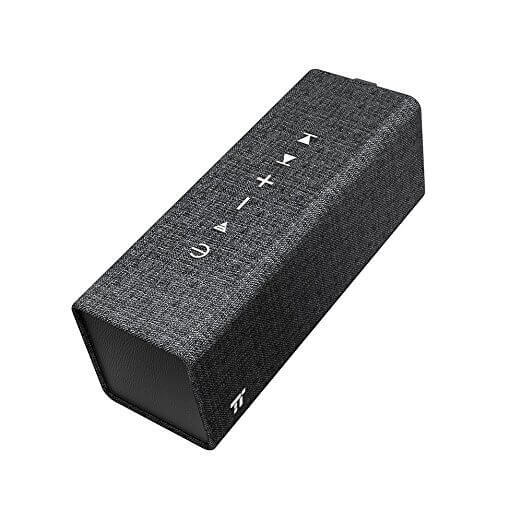 This Bluetooth speaker is the most powerful device on this list. 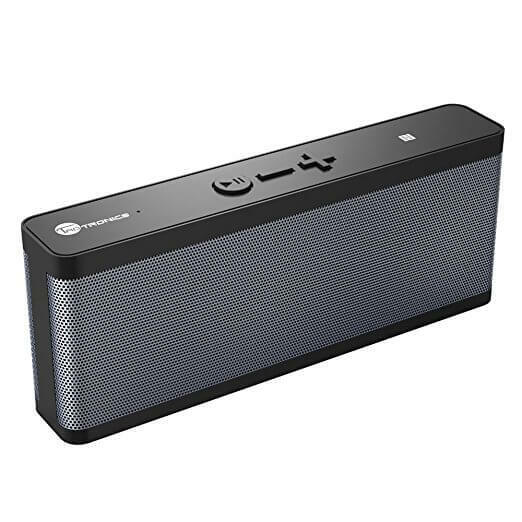 It offers two 10 watt speakers, making it suitable to listen not only indoors, but you can also take it for a trip, even if there is some background noise. The speaker can be used even if it’s charging, but it still draws power from the battery. The battery is non-removable and offers about six hours of play. Some speakers may also be used as a power bank to charge your other devices, but not this one, it offers no such feature, due to the lack of an output port. The device automatically turns off when it’s left alone for a few minutes. Another great option is the ability to pair two devices and use them at the same time. The last feature that I would like to mention is about phone calls. If somebody calls you, the speaker interrupts the music and returns after the call ends. PROS / Loud, nice design. CONS / Doesn’t work as a powerbank. This pocket-sized device offers an attractive black and gray design, composed of both plastic and aluminum. 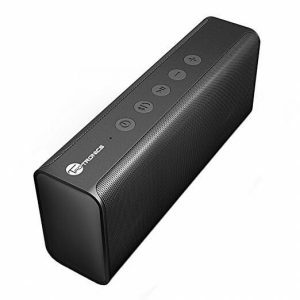 Although it uses only two 3 watt speakers on the front, it offers a nice clear sound and a quite powerful bass. When it comes to battery power, it can last up to 10 hours on a single charge. When you charge the battery you can use the device, charging will then take more time. Another great feature for people who use it with a smartphone is that you can use it as a speakerphone. It offers a great voice quality, but make sure that the mic is not covered when you are talking. 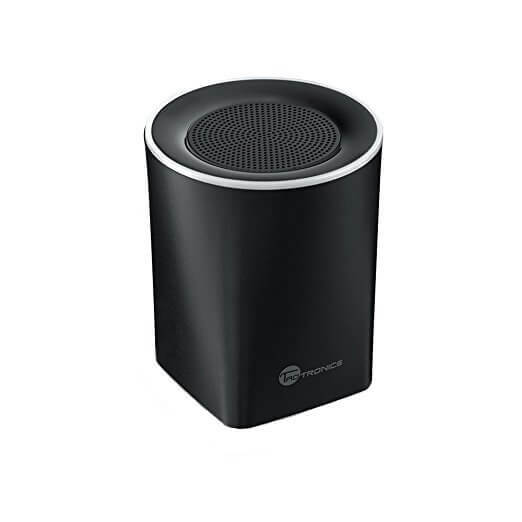 If you use this speaker outside, you may find important that it has the IPX4 water resistance rating. So don’t worry about a little bit of water, just don’t try to dip it inside a pool – remember, it’s water resistant, not waterproof. CONS / Cannot be used as a powerbank. 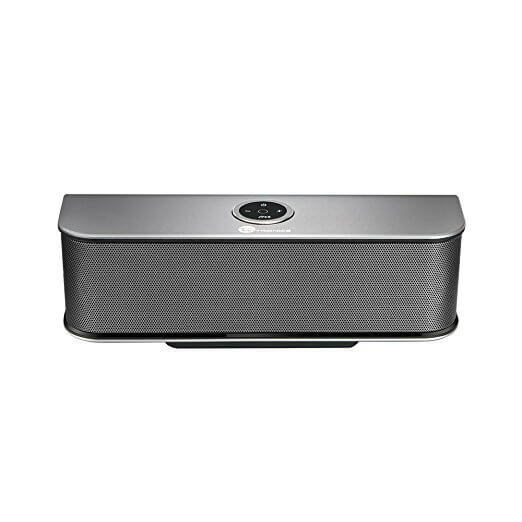 TT-SK10 uses two 7 watt speakers with a good passive subwoofer at the back that contributes to reproducing low-pitched audio nicely, making it a good candidate not only for listening music but also as a TV speaker. It takes 3 to 4 hours to fully recharge the battery. This is indicated by a little red LED light, which goes off when it stops charging. Of course, similarly to other speakers, you can listen to music when it charges. 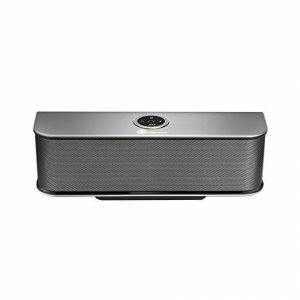 Speaker has an auto turn off functionality, which turns it off after a fixed period of time. At the top of the device, there are 5 buttons like power, muting, volume and answering the phone. PROS / A lot of control buttons, good bass. CONS / Cannot charge other devices. The last speaker on our list is TT-SK12. It’s a bit expensive but definitely worth its price. The biggest advantage of this speaker is that it lasts up to 24 hours on a single charge, offering clear sound and bass from its 2 x 8-watt speakers. Yes, that’s right, you can listen to your music all day and all night before you need to recharge it. Although it uses a powerful battery, it cannot be used as a power bank. Its design is quite unique. It’s clothed in a stylish textured linen. This was made in order to reduce noise resistance. PROS / Long play on a single charge.